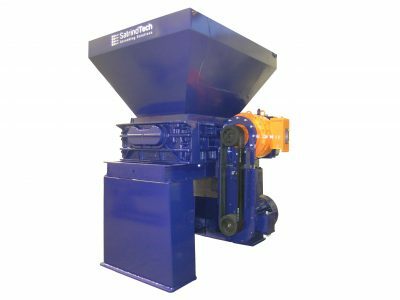 The hydraulic K50 shredders are suitable for volume reduction of the materials for which a 30hp shredder would not have enough torque for processing them. The shredders are mainly used in industrial applications that require a throughput from 800 kg7h to 3 t/h (the final production rate can vary according to the material processed and the type of blades adopted). The materials for which we recommend the use of a 50hp shredder are the following ones: plastic (purges in PET, HDPE, PVC, PP o PC, and plastic in general, pipes and profiles, PET bottles, etc., HDPE cans, drums and IBCs, automotive components in ABS, PU, PP, PE), RDF and SRF, packaging, car tyres, debeaded truck tyres, refridgerators (first step), oil filters, food waste, aluminum swarfs and cans (baled or losen), metal swarfs, electric cables, WEEE, confidential documents, paper, cardboards, wooden pallets, hazardous and pharmaceutical waste.